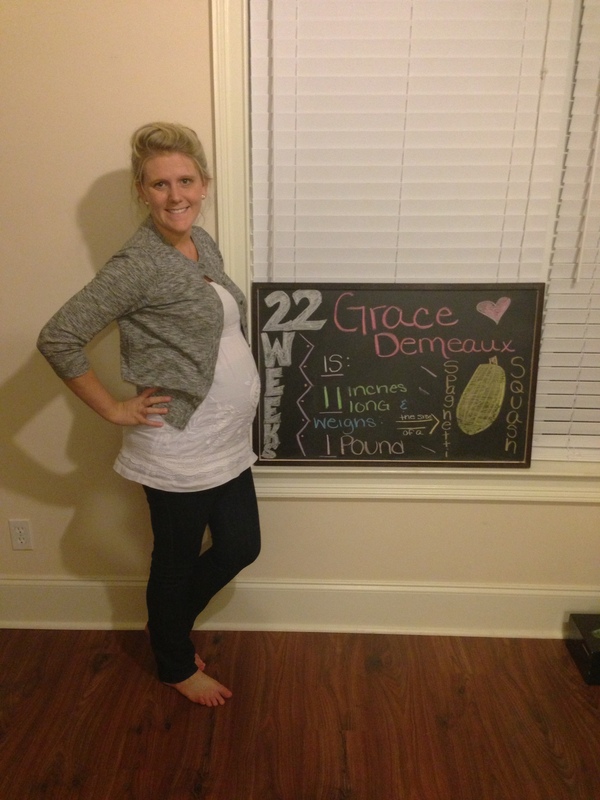 ← 20 WEEKS: Half Way There! Maternity clothes? : Saturday morning we hit the good morning what the heck is that moment, my stomach had pooched even more so we are officially just about all maternity! Sleep: Well the doctor says Demi is preparing me for sleepless nights…. Symptoms? : You name it I am pretty much feeling it right now! Happy or Moody most of the time? : Super crazy happy! This week, our sweet baby girl weighs in at a whopping pound and measures nearly 11 inches, about the size of a small doll, or spaghetti squash! 😉 But our little doll (who now has eyebrows, eyelashes, and maybe even some hair on that little head) is one who can now perceive light and dark. She can also hear our voice, my heartbeat, my gurgling stomach, and the whoosh-whoosh of blood circulating through my body. And as her brain and nerve endings develop, she may reach for her face (or whatever she can reach) just to experiment with her newfound sense of touch.